can be viewed at YouTube. 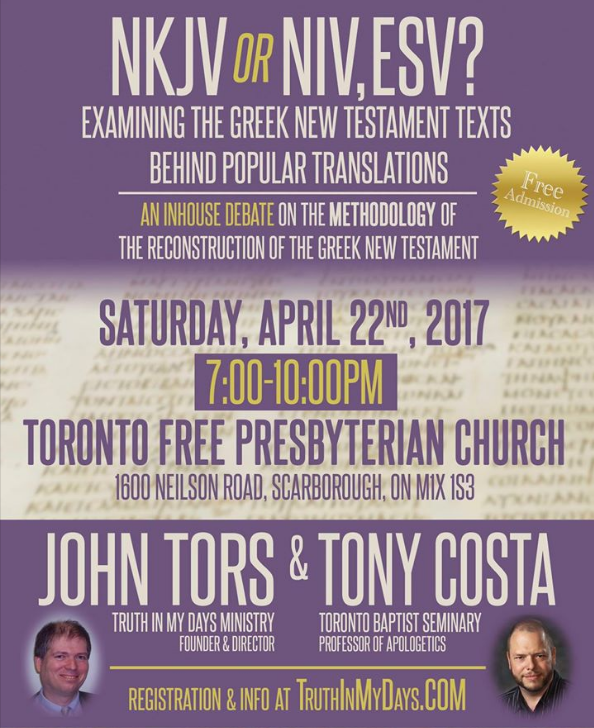 Last week in Toronto, John Tors, an advocate for the Majority Text, won a debate against Tony Costa, who attempted to defend the Nestle-Aland compilation. 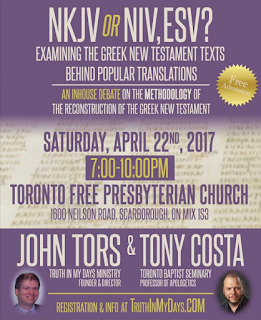 The stated purpose of the debate was to examine the Greek texts behind popular translations of the New Testament. Today (and in the next two posts, God willing) I will summarize their debate, and offer comments in italics at various points. The moderator, Johnny Yao-Chung Chao, welcomed guests to the Toronto Free Presbyterian Church, introduced the debaters, and offered an opening prayer. The debate was designed to consist of opening statements, followed by responses and a cross-examination period, followed by a time of spontaneous questions from the listeners. 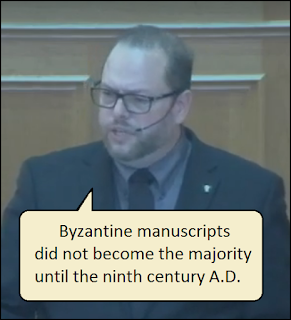 Costa then asserted, “For the first 300 years of the history of the church, all of the church fathers quoted from the Alexandrian text-type manuscripts, not from the Byzantine text-type manuscripts. At least not till about 350, with John Chrysostom.” Costa argued that the majority can change, and that the majority is not always right – just look at the majority of Germans who supported the Nazis, for example. The textual variant in First Timothy 3:16, Tors insisted, has an impact on doctrine. And the variant in John 7:8, where P66 and P75 and Codex Vaticanus disagree with the Nestle-Aland compilation, also has an impact. There are many, many more examples. (One could wish that he had specified a few more, such as Matthew 27:49 and Mark 6:22.) The survival of at least one doctrine of the faith – inerrancy – depends on which approach is used. (1) Scribes were more prone to add than to omit. (2) Scribes were prone to correct errors. (3) Scribes were prone to harmonize. Tors also mentioned that the advocates of the pro-Alexandrian school also cite the discovery of Egyptian papyri as a basis for their position – but before investigating that further, he turned to the just-listed canons, and asked the audience to see if they could detect the basic idea that they express. 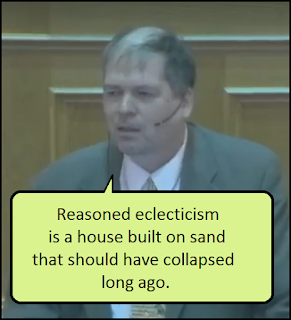 That idea, he said, is the fundamental foundation of the reasoned eclectic case: the idea that scribes altered the text on purpose. Griesbach – the scholar in the late 1700’s and early 1800’s who developed these canons – believed this, not because he had conducted thorough analytical research about scribal tendencies, but because he embraced a rationalistic philosophy, and these ideas simply seemed to make sense. His assumptions were accepted by textual critics for 200 years. However, Tors continued, those assumptions do not align with most of the evidence. Patristic writers consistently denounce those who altered the text of Scripture. 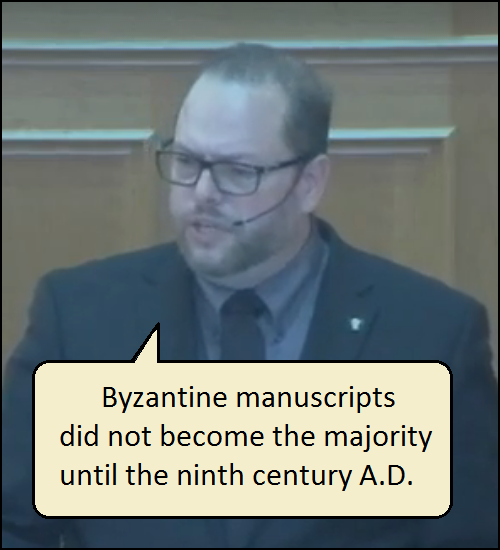 And one research-study after another – such as James Royse’s – show that the most common scribal error was omission. P66: agreed with Aleph 14 times, agreed with B 29 times, and agreed with TR 33 times. P75: agreed with Aleph 9 times, agreed with B 33 times, and agreed with TR 29 times. 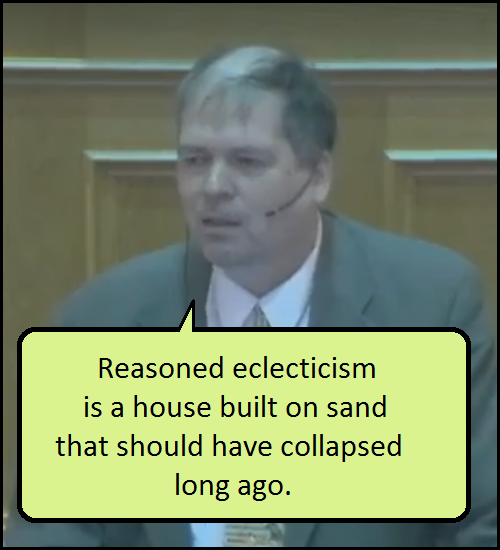 Thus ended the opening statements. Next: Part 2: The Debaters Respond. "White’s/Costa’s chart shows how many manuscripts have survived from each century." Are you sure? Or is it just a chart that shows which manuscripts Aland consulted in preparing the Nestle-Aland text? Thanks for summarizing it for us since I wouldn't likely be taking in the 3 hour debate right now. There has been some confusion about this chart, but I'm now satisfied that it reflects the dates of ALL extant manuscripts--with one caveat. Most of the famous Alexandrian codices are in fact block-mixed, to the point that the Byzantine portion of Codex Vaticanus has been given an entirely new identity as a different manuscript altogether (conveniently because it is in minuscule script, thus deriving its identification as 1957). Were we to divide up all the uncial codices this way--say, take A and L and divide each of them at the line of block-mixing--we would end up with two Byzantine manuscripts and two Alexandrian manuscripts, rather than zero of the one and two of the other. The more this is done, the less would be the numerical dominance of the Alexandrian.